What are the advantages in molded plastic or upholstered blood drawing chairs? Both molded plastic and upholstered styles are good options for blood drawing chairs for a busy facility. Molded plastic chairs tend to be easily to clean and slightly longer lasting since they do not have the softer surface area that can be cut, scratched or scuffed with wear. However, the upholstered models are more comfortable, an important consideration for patients. Both types of construction are designed to resist any type of contamination, mold and mildew. Seamless designed prohibit liquids from entering into the chair fabric even on the upholstered options. Surfaces can be sprayed with disinfectant and wiped down between each patient. The frames of both types of chairs are typically made of metal tubing. This is sturdy, strong and is very resistant to wear. With specialized coating on the metal there is no concern with rust or corrosion. Armrests, backrests and work areas on the arm of the chair should also be made of a water resistant surface that is easy to clean and fast drying. 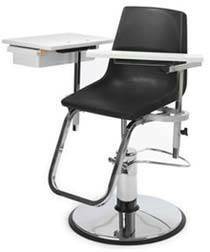 What is the correct positioning of blood drawing chairs in the laboratory or phlebotomy room? Patients that are in the laboratory or phlebotomy room need to have personal space as do the staff working with the patients. Depending on the style of equipment that you have the blood drawing chairs should be placed with enough room for staff to walk between the chairs and work on either side of the patient to draw blood. This typically means at least four feet between stations to avoid staff bumping into each other. In addition patients tend to feel more comfortable and relaxed if they do not feel crowded or cramped into an area. Besides the phlebotomy chairs a working area needs to be in place. This can be a station between each set of chairs that includes a workspace, storage area for phlebotomy and lab supplies, a Sharps container for used syringes and sample holders and writing supplies. When blood drawing chairs do not have cabinets or drawers under the armrest additional storage areas for gauze, alcohol pads, lancets, collection tubes and tape should also be within easy reach of each phlebotomist. Typically there will also be a need for basic medical equipment such as blood pressure cuffs, stethoscopes and other necessary equipment. Is there a cost benefit to electric blood drawing chairs? 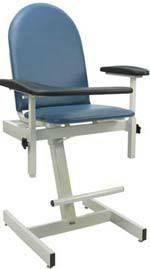 Having electric or power lift types of phlebotomy chairs in a lab or medical facility offers several advantages. Staff can quickly and easily adjust the height for their comfort when drawing blood without any discomfort to the patient. Patients are not required to step up into the equipment as they would with a tall or extra-tall chair option. This is often a major consideration for patients with mobility concerns, including senior citizens that may find stepping up into the chair as well as down out of the chair intimidating. Armrests on these models will usually flip up and sit parallel to the backrest, allowing patients maximum ability to enter the chair from the front or sides. Another feature of the electric model is that it can be placed in the reclining position for extended comfort and safety. Patients that are undergoing a longer procedure such as donating blood or having a blood transfusion can relax rather than having to sit in the traditional upright position. Fainting and dizziness can also be accommodated by tilting the chair to a comfortable reclined setting. These chairs are controlled using either a hand held keypad or a foot control. This allows smooth and fluid movement of the chair for raising, lowering and reclining.